Geaux Teacher! : A School is NOT a Democracy? If you've ever questioned the real intent of so-called education reform, ask no more. This editorial in "The Chicago Tribune" today lays it out - love it or leave it! What needs to be seen now is whether or not parents, taxpayers, legislators and educators will allow the corporatist elites to diminish democratic authority and the responsibility for retaining it as guaranteed to all people under the Constitution. Teachers at Drummond Thomas Montessori School in Chicago announced Friday that they will refuse to give their students the Illinois Standards Achievement Test this year. They joined a boycott announced earlier by teachers at Saucedo Elementary Scholastic Academy. They're refusing to administer a state-mandated test to students because ... they don't like the test. We're not big fans of the ISAT. Illinois has a sorry history of watering down the test, masking the real performance of children and falsely reassuring parents that their kids were on track to graduate. But state law requires that the test be given to elementary school children in the state. All children. No exceptions. State law doesn't say that teachers can opt out based on their distaste for standardized testing, or this particular test. CPS officials have notified teachers that if they encourage students not to take the ISAT they face discipline and could have their state teacher certification revoked. That's appropriate. There should be significant consequences for flouting the law. A school is not a democracy. (my emphasis) Teachers can't unilaterally decide to scrap a test and defy state law any more than students can veto a quiz because they forgot to study. These teachers set a terrible example for the school's 1,260 students and the entire district's 403,000 students. For all its problems and the history of manipulation, ISAT results can help teachers and parents understand how well children are performing academically and how well they stack up against their peers. The state has raised cut scores for students, making the tests a more genuine assessment. This year's ISAT is geared to the more rigorous Common Core curriculum standards rolling out across the state now. The test should show students how well prepared they are and where they need to improve. It will help teachers shape their lesson plans. And it will show parents if their students are gaining ground. 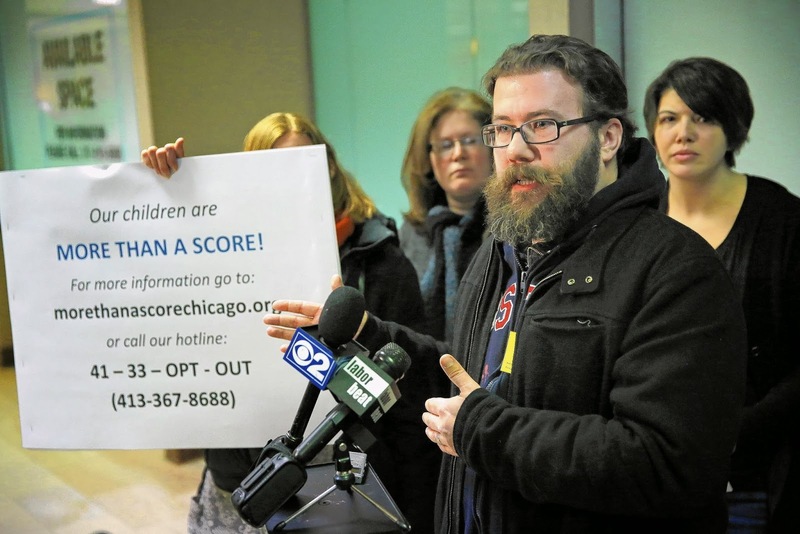 There's another reason to administer the test: If not enough students take it, cash-strapped CPS stands to lose millions in federal funding tied to the No Child Left Behind law. This is the ISAT's last year. Next year, a new and more challenging test tied to Common Core could reveal that even more students fall below statewide standards. That will be a shock to parents. Ditto for teachers, who are evaluated in part on how well their students perform on standardized tests. Teachers argue that there are too many standardized tests and preparing for them takes time from classroom learning. That's something to negotiate with CPS — which, we'd point out, has reduced the number of standardized tests that are given. CTU President Karen Lewis applauds what she says is the teachers' "act of civil disobedience." Illinois Federation of Teachers President Dan Montgomery chimes in that the teachers' boycott is "nothing short of a profile in courage." Teachers, you've made your point. Now set an example for your students and obey the law. So, according to the Chicago Tribune, "A school is not a democracy." -Indeed! "If a child struggles to clear the high bar at five feet, she will not become a "world class" jumper because someone raised the bar to six feet and yelled "jump higher," or if her “poor” performance is used to punish her coach."